A special guardian must have been watching over the little stone church for the last century. Its frame ravaged by termites, storms and the forces of time, Saint Philomena has continued to stand, for the most part intact, despite warnings that the next hurricane force wind could carry the unattached roof away. 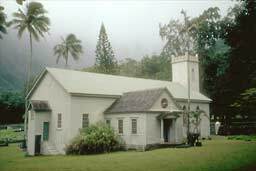 The historic church, built in Kalawao in 1872, is the last structure on the peninsula which bears witness to Father Damien’s life and work in this "isolation colony" for those who suffered from Hansen’s disease. (The peninsula is now designated the Kaluapapa National Historic park under the jurisdiction of the National Park Service.) 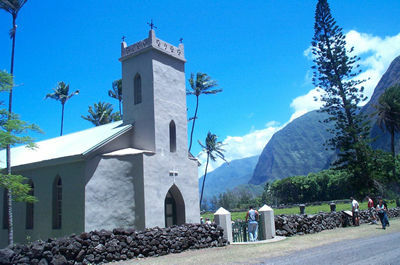 It was around this building that Father Damien centered his all-inclusive ministry on Molokai. 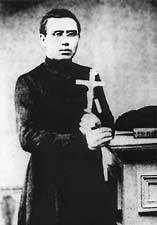 Father Damien, a missionary priest, born at Tremeloo, Belgium, 3 January 1840; died at Molokai, Hawaii, 15 April 1889. 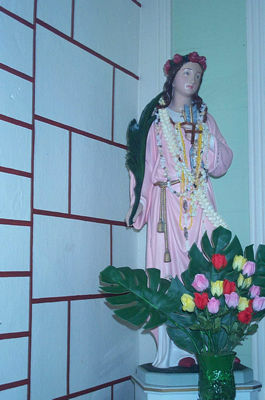 Saint Philomena was a joyful, spirited place, despite the disease that surrounded it. 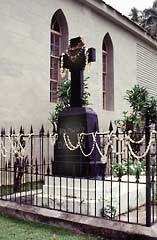 Understanding the Hawaiian love of elaborate ceremony and music, Father Damien celebrated services there complete with grand processions and song. Serving as a member of the choir came to be viewed as a great honor by the patients. The biggest event of the year was the Feast of Corpus Christi. Preparations for the day took weeks and the feast arrived with great pomp. According to the Historic Sites report on the chapel, :flowers were gathered and sown into wreaths, and on the feast day, while Damien carried the Blessed Sacrament through the village, children strewed petals along the way and other parishioners joined in hymns." Father Damien’s work addressed not only the spiritual lives of the patients, but their very real and basic needs for shelter, food and medical supplies as well. He championed their cause to the Board of Health who had previously expected the patients to produce their own food and shelter and thus allowed conditions prior to Damien’s arrival to sink to sub-human levels. In the short time from the settlement’s organization to Damien’s arrival, Kalawao had become a violent, anarchic society in which the strong enslaved those too disabled by the disease to resist. Damien began to turn things around almost immediately. He lived closely among the patients - feeding them, building homes for them, dressing their sores, dispensing medicines when he received it, and even impressing upon the more perverse members of the community the need for order and discipline. His care was not restricted to the Roman Catholics of Kalawao: all the patients received his attentions. Damien’s ministry, understandably, had quite an effect on his flock. As more converts were made, the pews of the small wooden structure overflowed and by 1876, the "west wing" or "transept" was added to Saint Philomena to accommodate the growing congregation. Damien is also said to have painted the interior and exterior in a variety of bright colors to suit Hawaiian tastes. 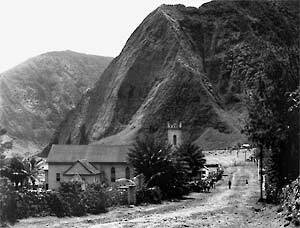 A small wooden building was being used for Catholic church services when Father Damien arrived at Kalawao in 1873. He and patient helpers enlarged the church twice. 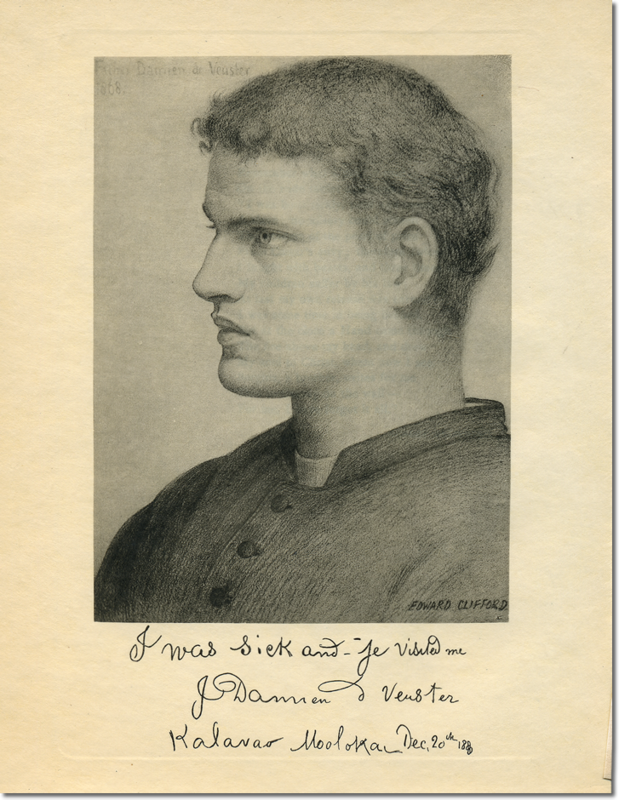 Brother Joseph Dutton completed the work after Damien's death in 1889. 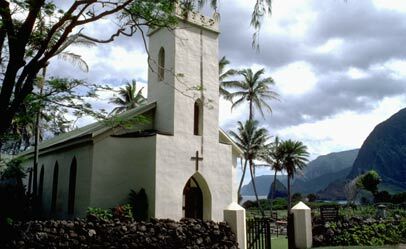 This historic church's breathtaking physical setting and nearby graveyards illustrate both the tragedy and the peace of Kalawao. These additions only sufficed for a decade. In 1888, just a year before Damien’s death, plans were made for major renovations to Saint Philomena. Although disfigured and weakened by Hansen’s disease, the priest oversaw construction of a more substantial stone structure, complete with bell tower, over and around the original wooden chapel. The presence of a stone mason among the patients and plenty of raw materials at hand enabled the residents of the settlement to provide most of the labor. 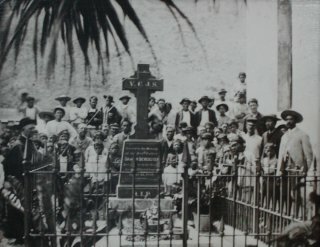 Construction was almost complete at the time of Father Damien’s death in 1889. Few changes were made to the church from that time until its final Mass was held on Christmas Eve, 1932. It was largely abandoned from that day until 1982, with the exception of sporadic community attempts to paint and maintain the structure. Click this photo to browse a page of 360º panoramics, including a view of the church interior.